John Ross offers a stunning re-creation of John Wesley Powell's heroic journey down the Colorado River. It's an epic adventure that forever transformed the American West. A timely, thrilling account of a man who, as an explorer, dared to lead the first succesful expedition down the Colorado through the Grand Canyon — and, as an American visionary, waged a bitterly-contested campaign for environmental sustainability in the American West. 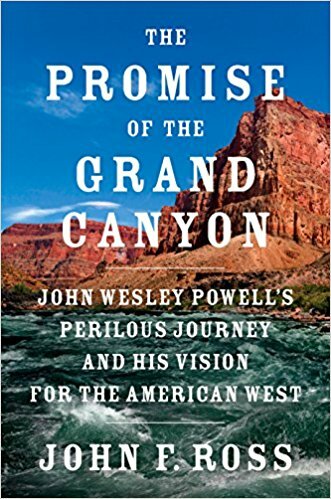 When John Wesley Powell became the first person to navigate the entire Colorado River, through the Grand Canyon, he completed what Lewis and Clark had begun nearly 70 years earlier — the final exploration of continental America. The son of an abolitionist preacher, a Civil War hero (who lost an arm at Shiloh), and a passionate naturalist and geologist, in 1869 Powell tackled the vast and dangerous gorge carved by the Colorado River and known today (thanks to Powell) as the Grand Canyon. If any man is the perfect subject for a new biography, it has to be John Wesley Powell. The Civil War hero who lost most of his right arm at the Battle of Shiloh and went on to be the first person to lead a successful boat expedition through the roaring Colorado River in the Grand Canyon makes for a great story. Ross's new biography describes Powell's talents in ethnography, geology, surveying, and mapping, along with his political acuity that helped shape America's federal science and Western land stewardship... In masterly use of primary and secondary sources, Ross makes Powell's wrangling with senators as fascinating as his river expeditions... If you've ever used a topographic map, thank Powell. His legacy deserves more attention, and Ross's biography stands to correct this. Ross makes vivid Powell’s adventures, drawing on journals and contemporary accounts, even capturing the drama of vicious battles among scientists vying for federal funds, including Powell’s clashes with senators and bureaucrats, in this fascinating portrait. This enthralling tale by adventure writer Ross focuses on the life of John Wesley Powell (1834–1902), an explorer, geologist, and early proponent of environmental sustainability... Ross displays a flair for adventure writing as he recounts Powell’s service with the Union Army during the Civil War (which cost him half an arm) and subsequent work on geological surveys of the West, and he renders Powell’s 1869 expedition of the Colorado River and the Grand Canyon in breathtaking detail... Ross demonstrates a facility for both human history and natural history, clearly showing why Powell’s ideas matter today. John Wesley Powell was not just a great explorer—he was the great prophet of the arid West whose vision is now coming true in a dusty era of drought and wildfire. This book reminds us to pay attention to savvy people, not to our preferred dreams and delusions—in that sense it couldn’t be more timely. Powell was famous in his day as the first Anglo explorer to travel the length of the Colorado River... His voyages down that wild watercourse are the stuff of legend... Ross' view through the lens of the unfolding [climate change] crisis lends Powell and his arguments new relevance. A long overdue look at the meaning of the American West and the critical environmental partnership between land and people. John Ross has enriched our understanding of Powell’s explorations and our turbulent legacy to protect what remains. This biography is, to borrow one of Ross's descriptions of Powell, "clear, authoritative, and dramatic." Ross covers Powell's upbringing in a staunch abolitionist home and recounts the Grand Canyon exploration with cinematic flair. He then dives into Powell's subsequent career as head of the U.S. Geological Survey, during which Powell warned about the fragility of the arid West. Ross's portrait of this complicated figure reveals how "generations of dueling developers and environmentalists have claimed [Powell] as their guiding star."